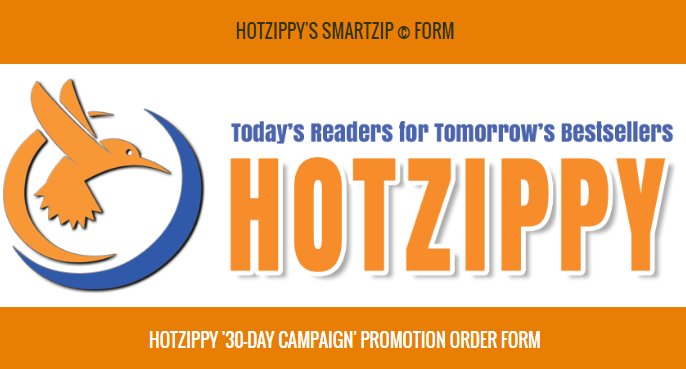 OUR CAMPAIGN PROMO TUTORIALLearn Step By Step How To Use The Campaign Promo SmartZip© Form. To save space we've incorporated additional text popups within the tutorial images. Simply click on any image and read the popup that accompanies it. Using the menu, move cursor to "Plans." From the "Plans" menu list, hover over "Campaign Promo." From the "Campaign Promo" menu list, hover over "30-Day Promo." From the "30-Day Promo" drop-down slide cursor down to "Buy Now!" Click "Buy Now!" The Campaign SmartZip© Form page opens. Firstly select the number of books you would like to submit for a Campaign Promo. Choose 1, 2 or 3. Each choice will increase the price accordingly. To continue to the next step of the form, click the "NEXT" button. If you experience trouble with the form, click the Support Ticket link to tell our staff about your issue. 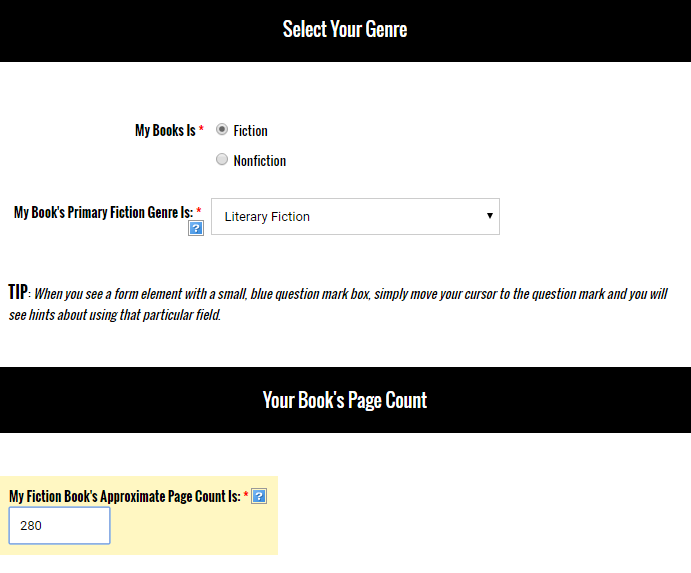 Select whether your book is Fiction or Nonfiction. 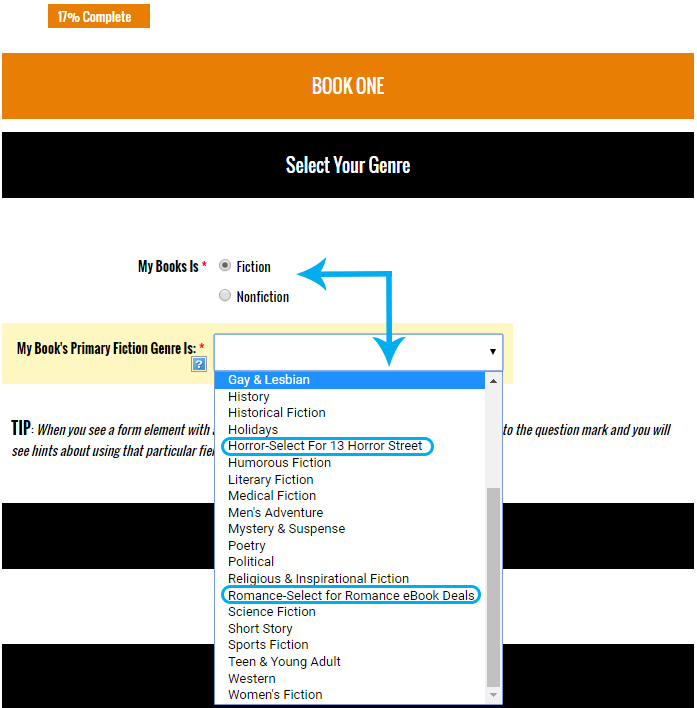 When fiction is selected, choose the most appropriate genre for your book from the Primary Genre Fiction dropdown list. NOTE: For your book to qualify for a promotion on 13 Horror Street you must select "Horror" for your primary genre. For your book to qualify for a promotion on Romance eBook Deals you must select "Romance" for your primary genre. If you selected Nonfiction you can then select the most appropriate genre from the Primary Genre Nonfiction dropdown list. Enter the page count of your book. The page count should not include specialty pages such as table of contents, about the author, link pages, or image pages. If you don't know the actual page count you can make an approximate guess; our editorial staff will double-check this before qualifying your book for its promotion. Fiction titles must be 32 pages or longer. Nonfiction titles must be 100 pages or longer. 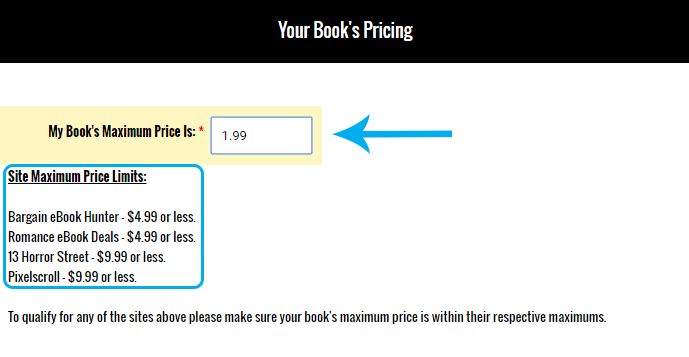 Books that are below 65 pages should not cost more than 99¢ to purchase. Whenever you see a blue question mark near a field title it is a signal to let you know that there is more information available about how to enter data into this field. Enter your book's price. If you have your eye on promoting with any specific sites, please ensure that you stay beneath the maximum price allowed for that site. 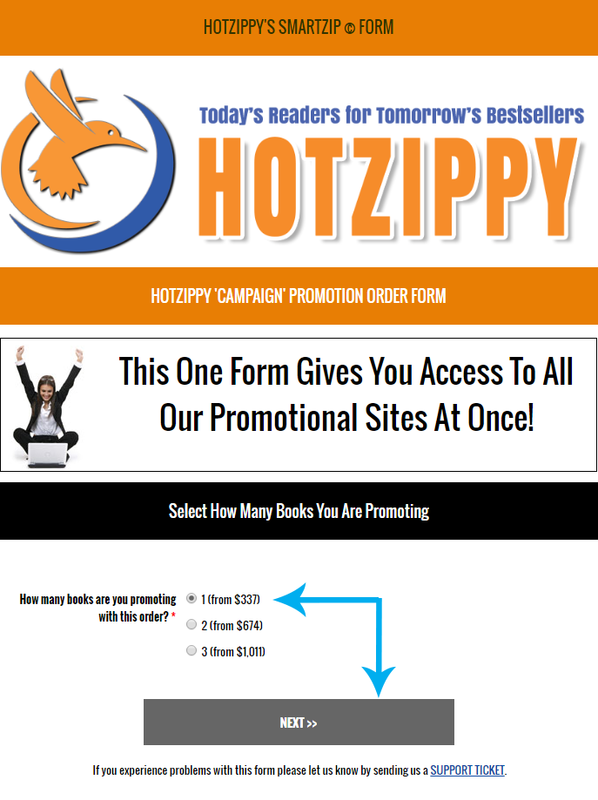 Under the "Site Selection and Duration" heading you'll see the promotional book sites that your book is eligible for. The SmartZip© Form has calculated your eligibility automatically by reviewing the information you have submitted thus far. All of the site fields are mandatory, so don't forget if you don't wish to promote on a certain site you must select "No Promo" beneath that site. For our example we are going to select a promotion with Pixelscroll. When you select a promotion for a site, a date field automatically appears. The date you select here is the day you want your promotion to begin on said site. How long your promotion will run on that site is decided by your selection. For our example, today's date is May 16, 2016. 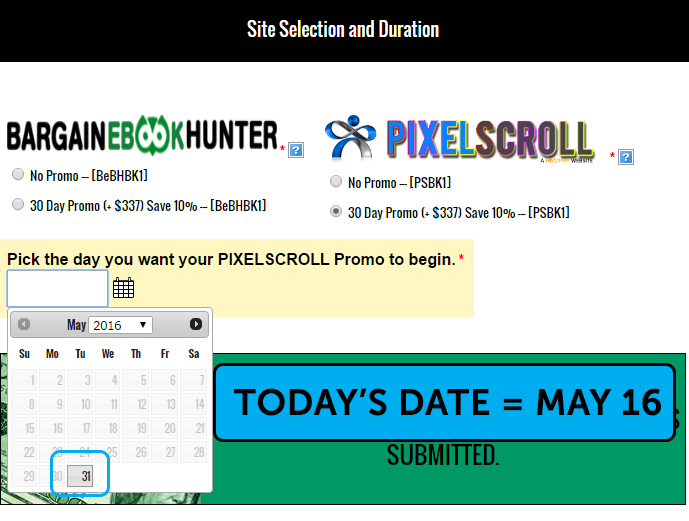 As you can see by the submission calendar for Pixelscroll, the next available date for your promotion is May 31, 2016. The next available date for a Campaign Promo is usually 15 days from your submission date: (Today+15). Remember to select "No Promo" for any site you are NOT promoting on. Once all of your site promotions have been scheduled, be sure to click the "Calculate" button to get an updated total for your promotion order. Remember that payment (via PayPal) is due at the final segment of the form. The form is only sent to us once a successful payment has been registered with PayPal and reported back to our system. If no payment is made or an error occurs with your payment, the form and all of its data will not be sent to our scheduling and editorial staff. First enter your ASIN. This is the number that Amazon has assigned to your book and can be found on your book's product page. Be careful using this field, it only accepts 10 characters and authors often make mistakes when entering this important number. Once the ASIN is entered, next enter the book's Title. Lastly enter the book's Author Name. 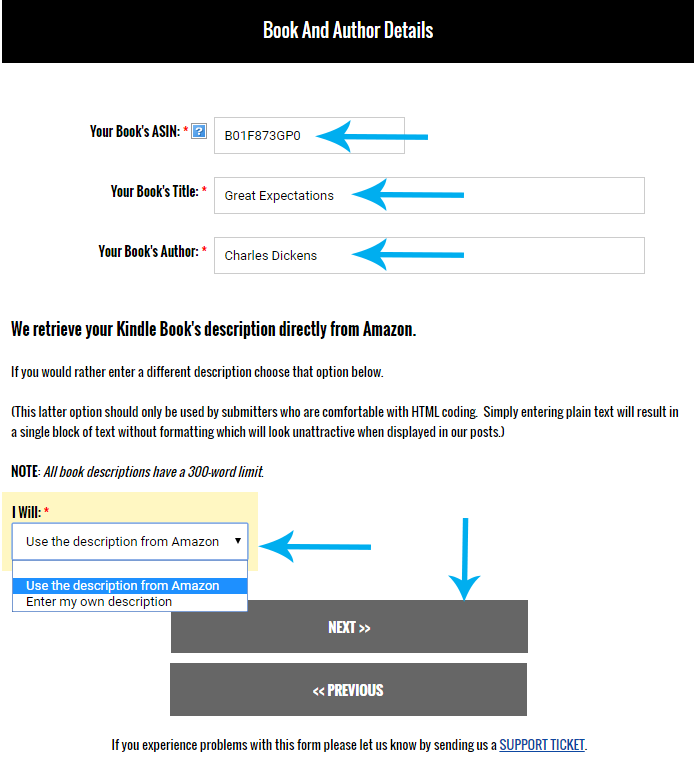 Our form allows you to let your book's description come from either the Amazon product page of your book or more advanced users can submit their own HTML formatted description. For our example we're going to choose "Use the description from Amazon." Finally, click the "NEXT" button to move to the next page of the form. The most common mistake authors make when submitting their information to us is using an incorrect or incomplete ASIN. Here is an opportunity to test your ASIN before continuing with your submission. Clicking the "Click here to test your ASIN" link will cause a new window or tab to open which should display your book's product page. If the page does not appear or is incorrect, please click the "PREVIOUS" button to go back a step and double check your ASIN. In our example, the correct product page is loaded so we now know our ASIN is correct. "How did you hear about us?" 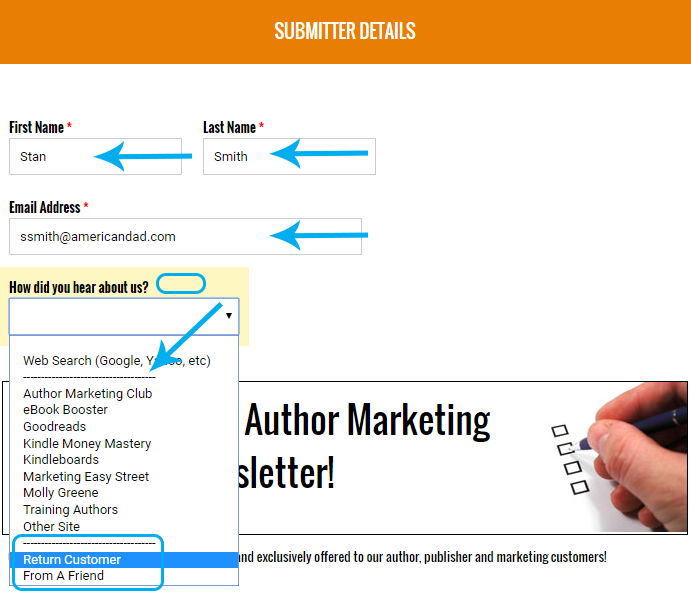 is an optional field that helps us determine how authors are finding us. This is helpful to us for many reasons and we appreciate those who take the time to fill it out. Certain choices from this last field change what appears on this page. When "Other" is selected in the "How did you hear about us?" field, a box appears for you to enter the other site that you followed to find us. When "From A Friend" is selected in the "How did you hear about us?" field, an optional box appears for you to enter your friend's name. When "Return Customer" is selected in the "How did you hear about us?" 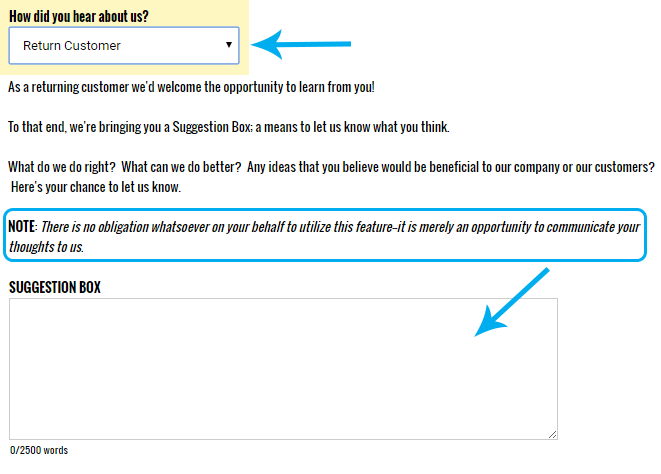 field, an optional message area appears for you to use as a suggestion box. As a return customer your opinion means a lot to us. 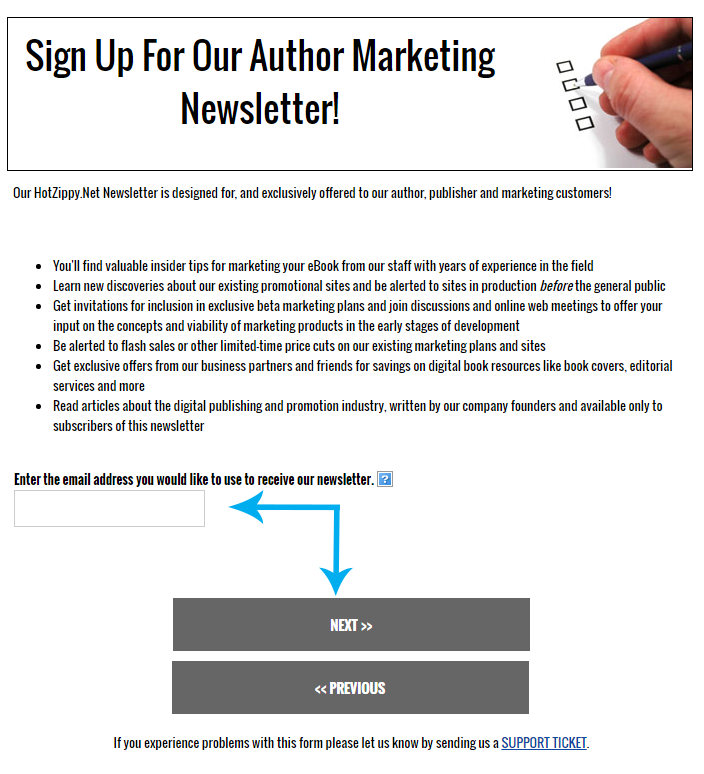 Here you can sign-up for our Author Portal newsletter. If you wish to opt-in, set the email address you would like the newsletter to be sent to in the field. Otherwise leave the field blank. 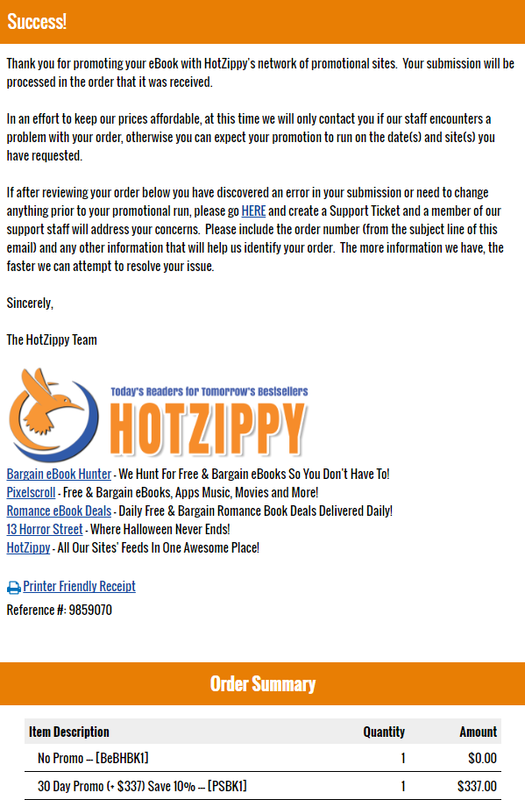 Once your submitter information has been completed and you have clicked the "NEXT" button, you will see the Billing screen. Periodically we will offer seasonal coupons or short-term flash sales on our products. These sales will be either for a % or a $ amount off your total purchase. If you have a current coupon, this is where you'll enter it. 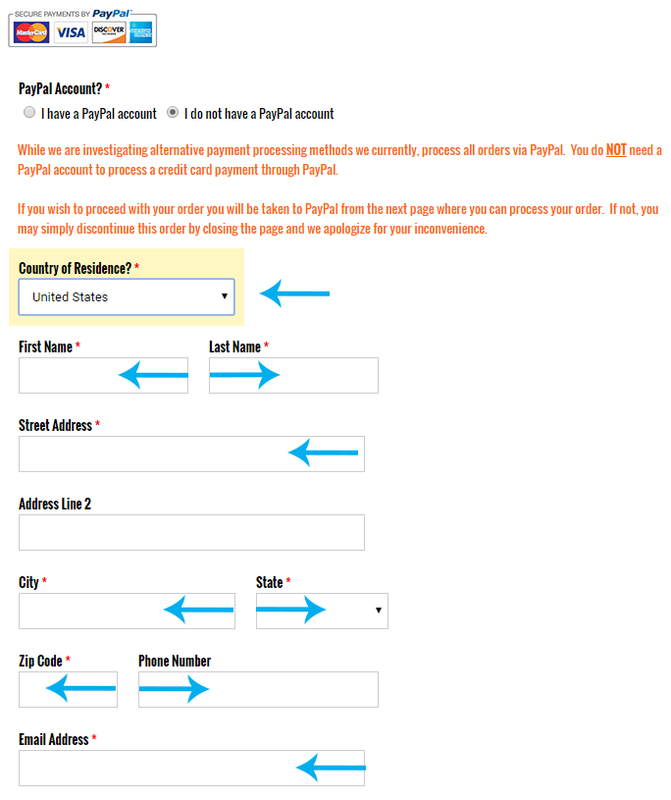 If you have a PayPal account select that option here. Enter your PayPal User Name. Enter your PayPal Email Account. This helps us find your order in case we need to issue a refund or research your purchase. 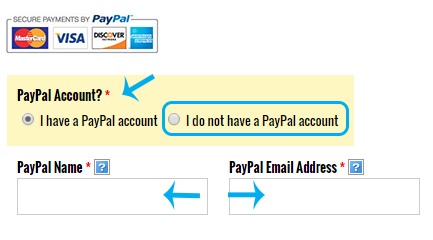 If you don't have a PayPal account select that option here. Because it is more difficult to track non-PayPal account holders we require some more information to be able to serve you better. Please enter your "Country of Residence." Depending on the country you select, certain contact information will appear. Please fill in this contact information block. For our example we are going to use "I have a PayPal account." There are two remaining fields on this page, both optional. 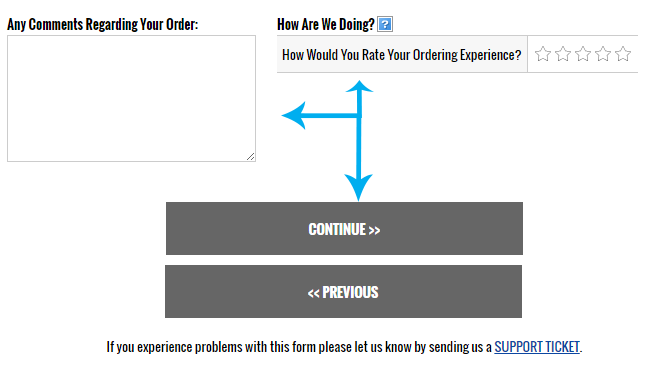 First an area to place any comments about your order that you may want to share. Secondly there is a small star-rating bar that you can score your order process with. When done, click the "CONTINUE" button to move to the final stage. Here you will see your final itemized order and total amount due. 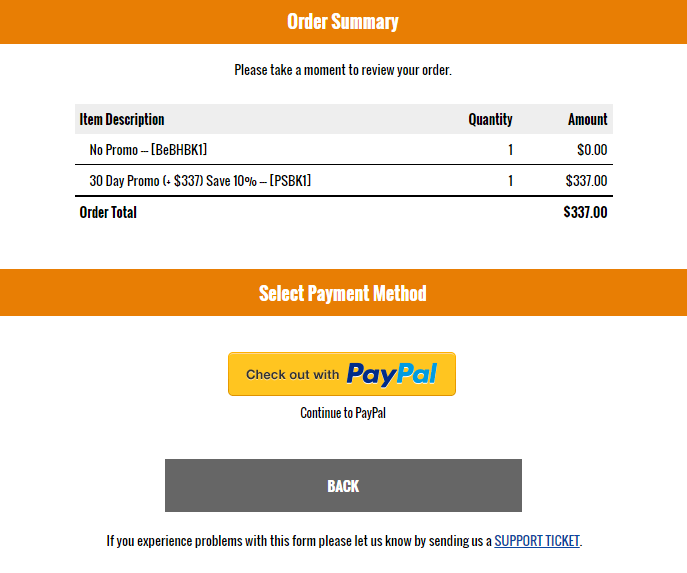 When ready, click the "Checkout with PayPal" button. This will take you to PayPal where you can finalize your payment. 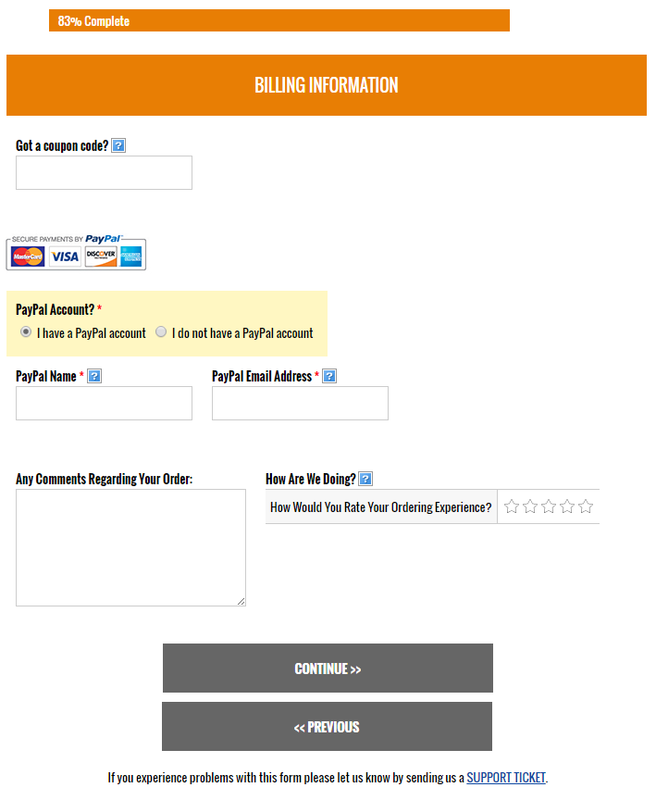 Here is the success page you will see once your payment has been successfully processed. A version of this will also be emailed to you for your records. Please hold onto this receipt as it contains your order number which you will need should you require support assistance. Thank you for using this tutorial.